Many stories were written about the romantic journeys across Europe aboard the trains of the Orient Express System. And no wonder - it was over 2,000 kilometers long! Falling angels? No, Angel Falls waterfalls! 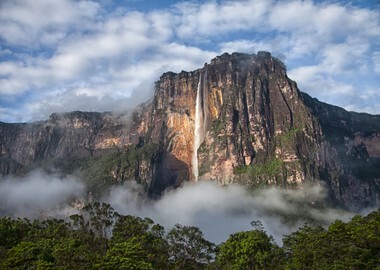 Just a little under one thousand meters tall (a huge hello to Touchmooners who have reached this height with us), this waterfall, located in the Canaima National Park, really brings the heavens a little closer to the Earth. 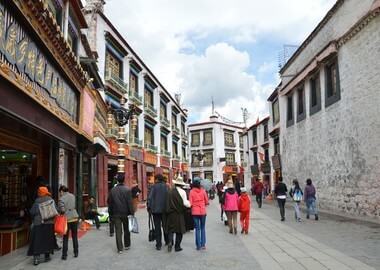 In Lhasa, a quarter of a million people live at an altitude of over 3 and a half kilometers. And they seldom get dizzy! 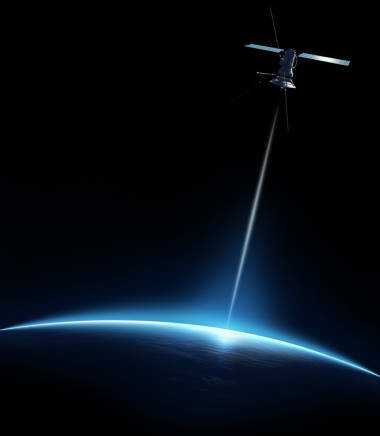 After many years of construction, through jungles and forests, today this 77- kilometer communicator is a vital element of world trade, connecting the Atlantic and the Pacific Ocean and providing us with a place to take a break on our journey to the Moon. 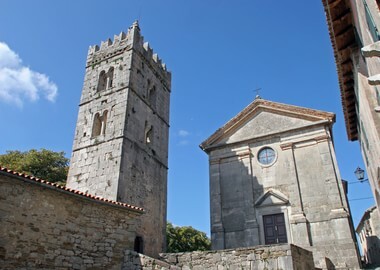 Did you know that the lean of this 57 meters high bell tower changes over time? There is a big chance that the tourist photos of you pushing the tower back up become outdated at some point. All the more reason to visit again! This 6,900 meters tall titan of rock, snow, cold, thin air and remote passages did not stop one person, Kilian Jornet, from setting the world record by climbing the top and descending in a little over twelve and a half hours! We are going to the Moon, and it seems only fitting that we climb the oldest of the Seven Wonders of the World to get there! 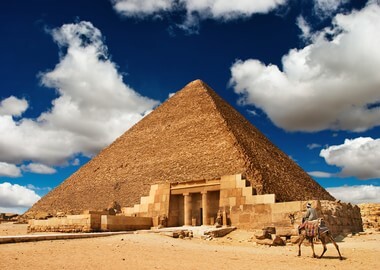 The Great Pyramid of Giza, also known as the Pyramid of Cheops, is an extraordinary 2.3 million stone block tomb that has impressed travelers since before the new era. At 170 meters it was the highest structure in the world for a long time - remember, this was a time when mammoths still roamed the Earth! It is believed that it was built over a period of (only!) 10 to 20 years, 2500 years BC. 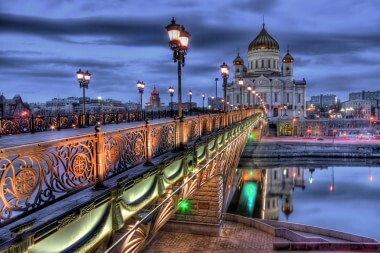 Even with all the technology at our disposal, it would cost around 5 billion dollars to build such a structure today! Nessie, come out to play? 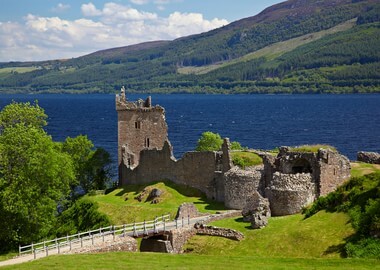 The famous Loch Ness, situated in the Scottish Highlands, is said to be the home of a mysterious, elusive creature called Nessie. Apart from monsters, this second largest Scottish lake, with a maximum depth of 227 meters, is a home to many freshwater fish. A small church made entirely out of ice was built high in the Romanian Fagaras Mountains, near glacier lake Balea Lac. It is a symbol of religious tolerance and is only accessible by cable car. The new Riviera? 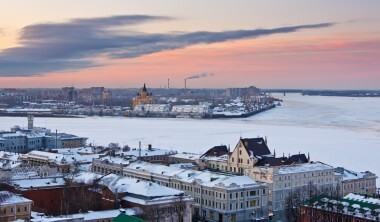 Extravagant hotels, artist havens, and lots of history along the coastal belt of 5,835 km. One of our favorite rest points (the city of Sibenik) on the trip to the Moon! Over 600 kilometers of the seashore where the sun shines more than 300 days a year. 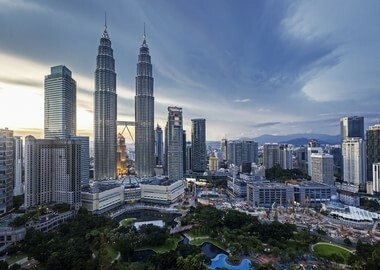 The Petronas Twin Towers, completed in 1996, remain the tallest twin towers in the world. This postmodern miracle of engineering cost around 1.6 billion dollars and is both a popular tourist attraction and a prestigious office space. A supertall skyscraper, formerly called the Taipei World Financial Center, ranked highest in the world from 2004 until 2010. It holds one other very important record - it is the largest green (sustainable) building! The Tokyo Sky Tree's fairytale feature stems from two characteristics: the "Sky Tree" name, which evokes a story about a certain type of magic beans, and the fact that you can dine at an altitude of 345 meters. Oh, and this broadcast tower is also illuminated with LED lights, which makes it even more fun to visit on our trip to the Moon. It is the mountain some of you know from the opening scene of "the Lion King", a dormant volcanic snow-capped mountain that is the tallest free-standing mountain in the world. Mt. 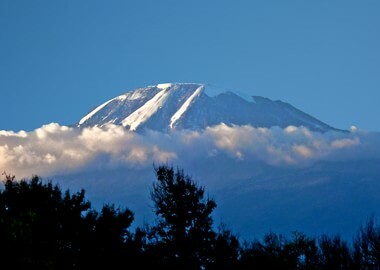 Kilimanjaro is rich in biodiversity and attracts climbers and researchers (and Touchmoon visitors) from all over the world. Is this view even possible? Yes, in the artist's dreams. And in South Africa. 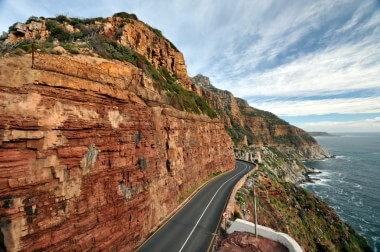 Among its 364,131 km of roads sits the one of Chapman's Peak and it is not to be omitted. Do you like zigzag roads? 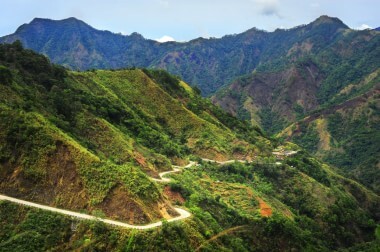 A beautiful, yet challenging gem of the country's roadway network ( 213,151 km) is the Cordillera Mountains road. 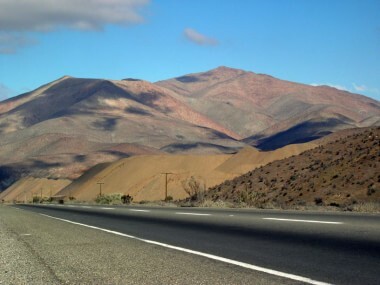 Cordillera is referred to as "La Ruta Panoramica". Translation not needed. Two decades long horseback ride! German explorer Guenter Wamser started his 25,000 kilometers long journey in Patagonia, Argentina. He brought it to a close in Alaska in 2013. Everything about this pyramid is dipped in symbolic meaning, starting with its name and position - alongside the Avenue of the Dead, near the Pyramid of the Moon. This massive 75 meters tall structure was built in Teotihuacan around 200 AD. Paro is the name of the tallest moai on the Easter Island, built around 1620. It is 10 meters tall. The Corbet's Couloir is a 150 meters short run that has been named the world's scariest slope on several occasions. Probably the most talked about iron tower in the world. Initially, it was not meant to last. It was built as an archway entrance to the 1889 World's Fair, and was criticised for being ugly and of failed design. 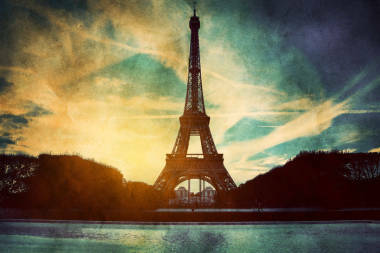 The tower stood proud and proved to be a true icon over time. 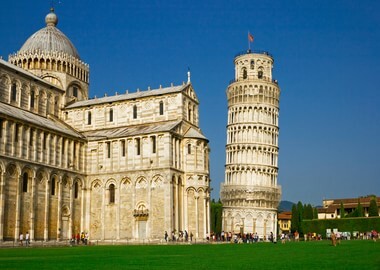 In fact, it is so iconic, today there are over 40 replicas around the world! As for the view, it really is magnificent. 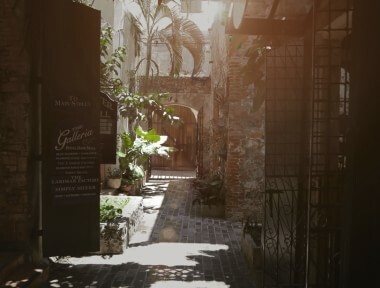 Do you know there is a virtual tour? An ancient circus at the heart of an Empire. What is now known as Sultanahmet Meydanı in Istanbul was once the famed hippodrome of Constantinople. It measured 480 meters in length and was a sporting, as well as a social centre of the Byzantine capital. This type of venue was called a circus, but it was quite different from the circus we know today. Of the original structure, only two obelisks have survived. 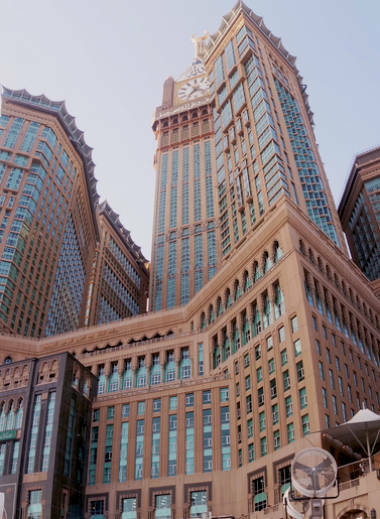 Abraj Al-Bait is an enormous complex in Mecca housing the Saudi Arabian jewel Makkah Royal Clock Royal Tower. The construction of the tallest clock tower, completed in 2012 at the location where Ottoman fortress once stood, was faced with various challenges, including strong winds. Ski runs are color-coded, with black being the hardest (and scariest). 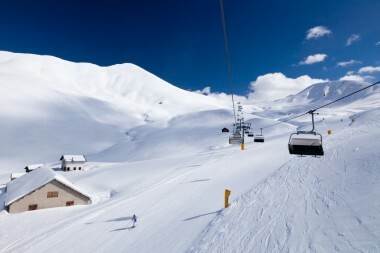 The black run in the ski region Ciampac in the Italian Dolomites has a vertical drop of 660 meters. Watch out! The Zuma Rock in Nigeria is the second largest monolith in the world, 725 meters tall. Yes, that is 725 m of a single, massive rock! And if that isn't special enough, some say that you can see a face in the white at the center of the rock. A rocket ship shaped building with a swirly, cakelike top? 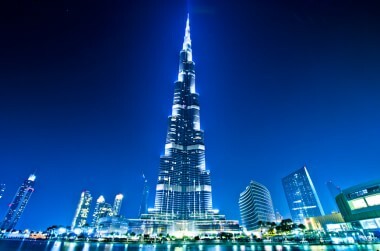 Pick your description for the tallest building on Earth! As if the title was not enough, this giant in downtown Dubai boasts a hotel designed by Giorgio Armani. And, why would it be too extravagant for us? 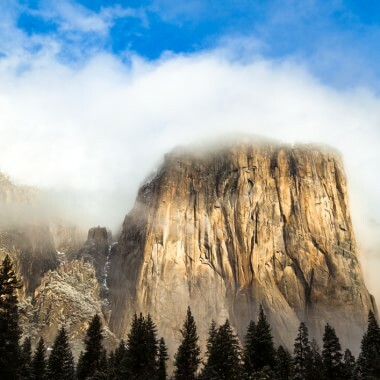 The name El Capitan derives from the Ahwaneechee name To-to-kon oo-lah, which means The Chief, and climbers usually call it El Cap. It is formed from a single piece of granite and is considered to be the biggest granite monolith in the world, standing 910 meters tall. Ben Nevis is the highest peak of the British Isles, located in the Scottish Highlands. It is a very popular climb, and around a third of the annual climbers opt for the pony track, from the Glen Navis at the bottom of the mountain. We don't know about you, but for us this is the dream! 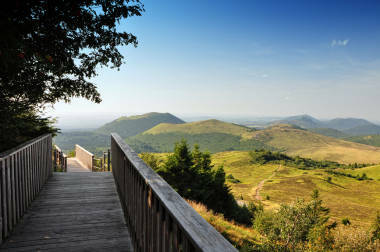 Dinara is a mountain on the border between Bosnia and Herzegovina and Croatia. The summit Sinjal or Dinara, at 1,831 meters, is the highest point of Croatia. This 100 kilometers long mountain is the inspiration behind the name of the longest range in the Balkans - the Dinaric Alps, stretching from Slovenia, via Croatia, Bosnia and Herzegovina and Montenegro, to Albania. The deepest known cave in the world is called the Krubera Cave, or Voronya Cave (Russian for Crow's Cave). It is 2,197 meters deep and is located in the Arabika Massif, in the Western Caucasus region of Georgia. It seems like a good place to start a journey to the center of the Earth, doesn't it? Nothing about this site is ordinary. 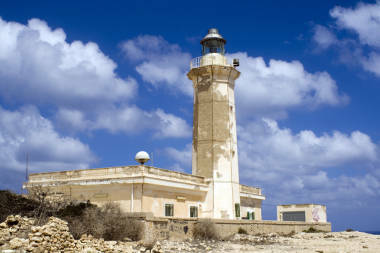 It was made known to the outside world in 1911 and listed on the UNESCO World Heritage List in 1983. The Machu Picchu is a gem of the Inca Empire, in the middle of a tropical forest, at an altitude of 2,430 meters, and it looks like it has grown out of the rock itself. 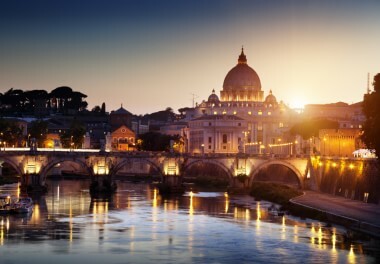 Vatican City is both a city and a state. If you were to literally walk around the city, meaning to follow it's borderline, you would only have to walk 2300 meters. But what sights you'd see! At the Equator. The imaginary 40,000km line hugging the Earth full circle passes through 13 countries. 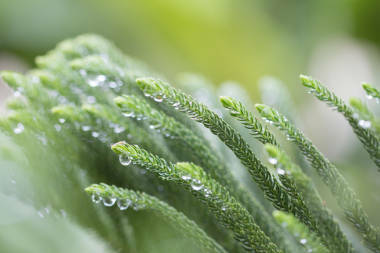 The seasons of many equatorial areas can be divided into wet and dry. Well, mostly wet. Think the Amazon rainforest. Literally meaning the sea in the middle of the land, this gorgeous sea covers an area of around 2.5 square kilometers, and is connected to the "outer" seas through the narrow (14 km) Strait of Gibraltar. 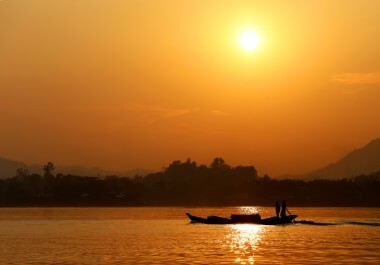 Because of its mild climate and abundant waters, it is the cradle of many antique cultures. At its deepest point it is 4,632 meters deep. 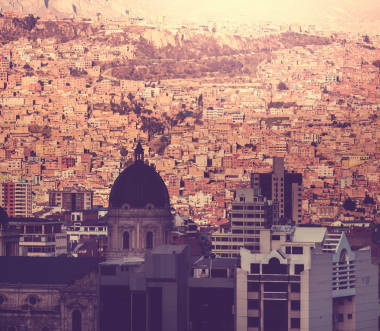 El Alto is a fast-growing, urban city in the La Paz department of Bolivia, with around one million inhabitants. One difference sets it apart from other major cities - the average elevation is 4,150 m! El Alto is also the highest metropolis in the world. Did you know? 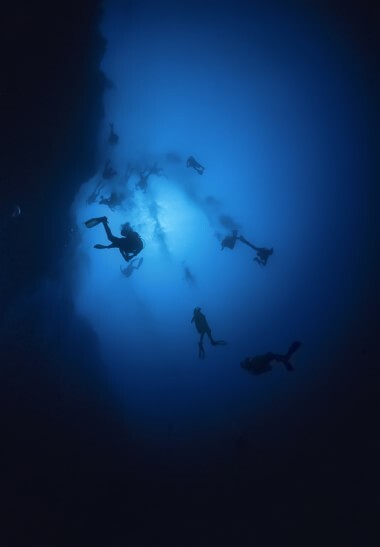 One third of the world's shipping transits through these 5,016 meters deep waters! 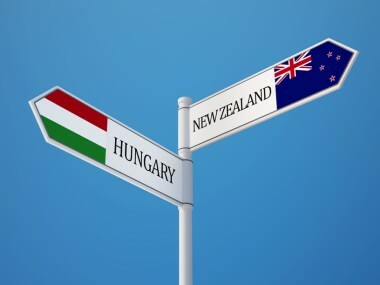 Air distance between the capital cities of New Zealand and Hungary is almost 18,000km. 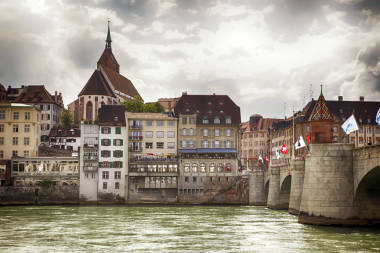 The grandest river in Europe measures 3,685 km. 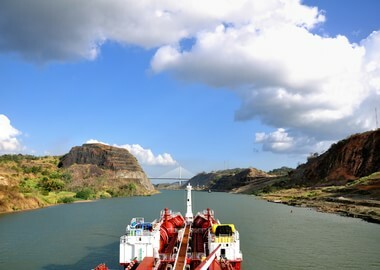 After it joins waters with Oka, another mighty waterway in Russia, Volga doubles in size. The result is the winter magic shown in the photo. The ride of 10,214km lasts about 7 days and you don't change trains even once. This journey from Russia to North Korea includes sections of the exciting Trans-Siberian route. It might become the regular route. A December 2014 test ride from Yiwu to Madrid lasted 20 days. It was dubbed the silk road of our time. The train carried toys, stationery and other materials to Spain, and it left the country with olive oil, wine and cured ham on board. 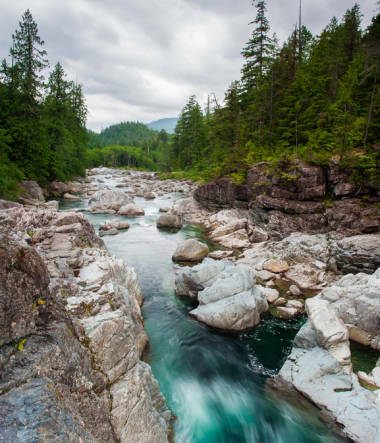 Coast to coast hiking trail will stretch 24000 km. 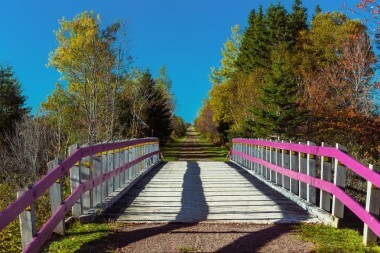 This hiking, biking or even snowmobile-riding trail is currently 17,000 km long and growing. So, it does not come as a surprise that, as Trans Canada website points out, "four out of five Canadians live within 30 minutes of the Trail." 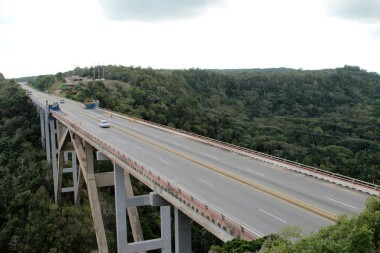 We hope all 60,858 km of Cuban roads prove to be as exciting as this road bridge above the valley of palms is. 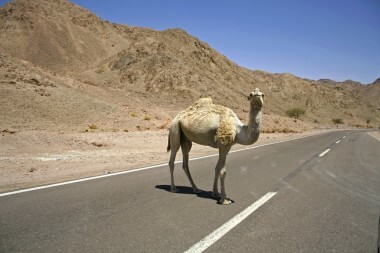 While the experience does not necessarily include the camel in the middle of the road, this photo was just too cute to be left out:) Total roads in Egypt, including the section shown, amount to over 137,400 km, which puts the country in the 37th place in the world. Although not actually bottomless, the bottom of the Atlantic ocean is quite remote - at a depth of 9, 219 meters. Can you hear little Sebastian singing "Under the Sea"? 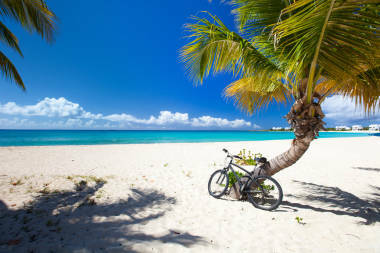 The small Caribbean island of Saint Martin is known as Saint-Martin in French and as Sint Maarten in Dutch. 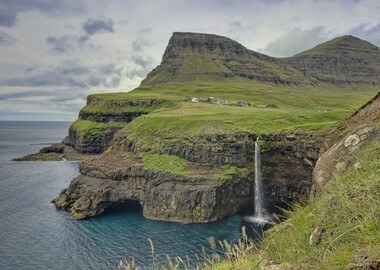 It is the smallest inhabited sea island in the world divided between two nations. The French part is about 61 percent, and the Dutch part is about 39 percent. Regardless, there is enough of this paradise for everybody! If you would walk across the island from east to west, you would have to cross 10.2 kilometers. And what a walk that would be! Look over here, San Marino! 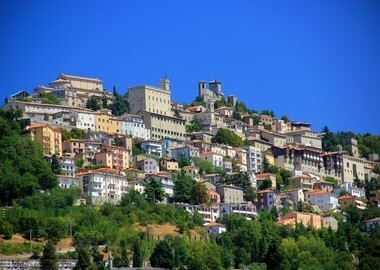 The total border length of San Marino is 39,400 meters. There is more to them than Copacabana. Every tourist on any riviera anywhere in the world will at some point stumble upon a bar or a cafe named Copacabana :) "She" is that popular. 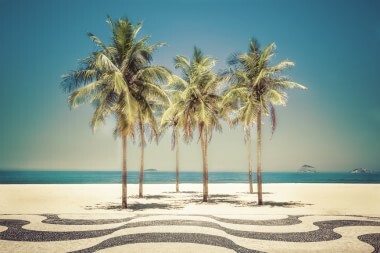 But, Copacabana is only one of the many beaches in the Rio de Janeiro area. Together, they stretch 90 kilometers. 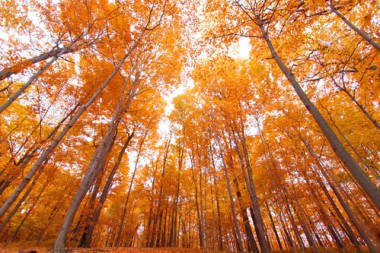 No wonder a country this big (14,000 land border) has 6 seasons: spring, summer, monsoon, autumn, winter, and prevernal. 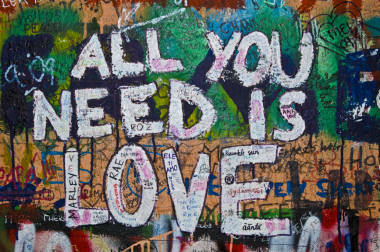 Fellow travelers, let's stop here and experience at least one of them! Into the space he went. 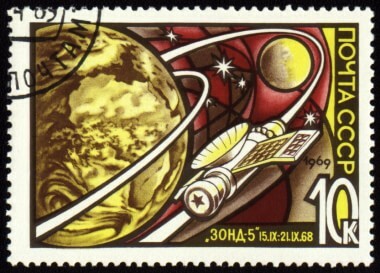 In 1968, the Russian unmanned spacecraft Zond 4 traveled 330,000 km above the Earth. It was sent in a direction away from the Moon's orbit. One of the main aims was to test the capsule for the future, crewed lunar missions. However, Zond 4 was destroyed upon the re-entry because its guidance system failed. He crossed 75,000 km on foot. Jean Beliveau returned home to Canada in 2011, after he literally walked around the world for 11 years. The ride from Alaska to Argentina is 48,000 km long. Along Greece's 117 thousand kilometers of roads lie so many lively canvases. 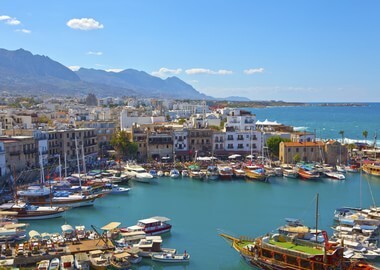 Take this country road in Crete for example where we are going to take a short break and then keep cheering each other on - all the way to the Moon! 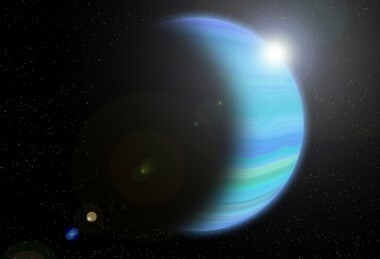 It took a photo of Neptune's rings from 280,000 km away in 1989. Culture, design, trade, history, energy... take your pick. Did you know that Hamadan is one of the oldest cities in the world? 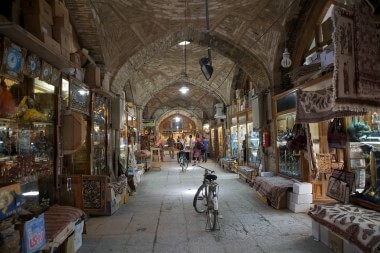 Or that the city of Isfahan (in the photo), in central Iran, boasts one of the oldest and biggest markets in the Middle East? Have you seen Iran's utterly fascinating capital yet? As for the energy infrastructure, the country has a respectable 38,906 km of pipelines. 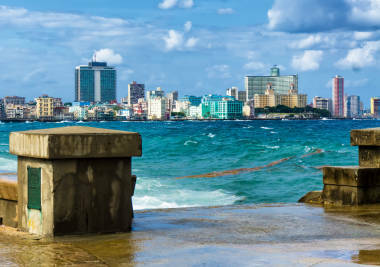 People say Malecon, the 8-kilometer promenade along Havana's harbor. Known for its playful spices, Turkey even has a city named for saffron - Safranbolu. It means "having plenty of saffron." Although the country's coastline spreads 72,000 km, the flavors and fragrances go far, far beyond it. 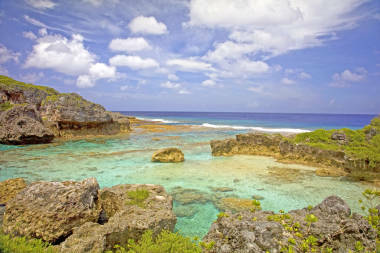 A long, narrow island in the Caribbean, Anguilla ('eel' in Spanish) boasts a scenic shoreline stretching 61 km. An island in the English Channel with a coastline of 70 km and a dragon story:) As the legend goes, Jersey was once home of a terrible dragon defeated by the Seigneur De Hambye from Normandy, who was then killed by his squire. 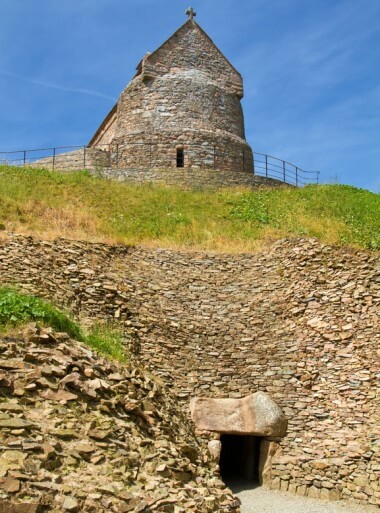 His wife later raised a mound for him in Jersey known as La Hougue Bie (in the photo). The crew of Apollo 17 took the first full-view, "Blue Marble", photo of Earth in 1972 from 45,000 km away - the distance we have reached now. The Moon awaits! 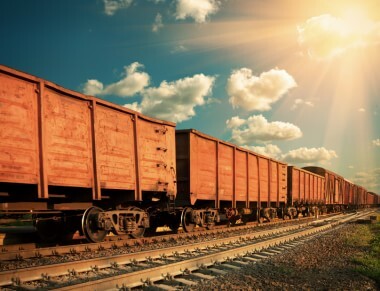 RailNet Europe brings together over 230,000 km of the continent's railway tracks. 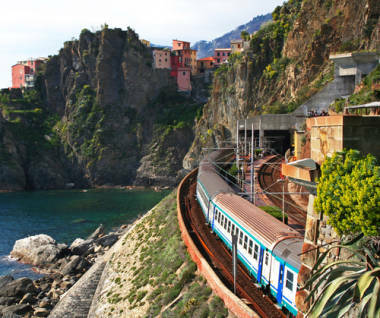 The European train station that caught our eye was the one in Manarola, Italy (shown here). We will stop here for refreshments before we finally Touchmoon! 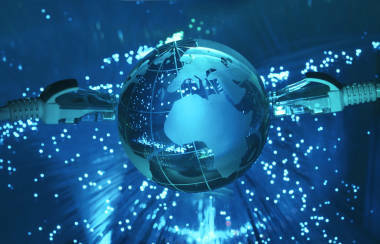 The 30,000 km submarine cable link connects Australia, New Zealand, Hawaii, and the U.S. West Coast. We are now so close to the Moon and at the place from which the European Space Agency's satellite beamed an image of Berlin from 35,405 km above Earth in almost real time in 2014. You are now traversing a 32 km long range in France numbering 80 volcanoes. Touchmoon salutes you! This spoon-shaped Arctic island was named after the Dutch captain who discovered it in the 1610's. It is also the 54 km milestone (Jan Mayen's length) on our adventure. 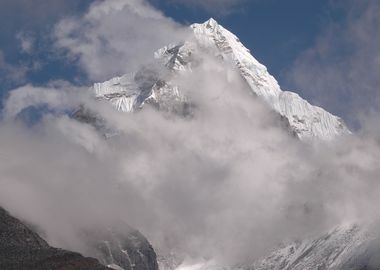 From the dawn of time, only 246 people climbed the K2, known as the Savage Mountain, because of how extremely difficult the ascent is. With 220 million mobile internet users in 2013, India was already among the top communicators in the world :) Hello India, all 220 million Touchmooners came to visit on the way to the Moon! 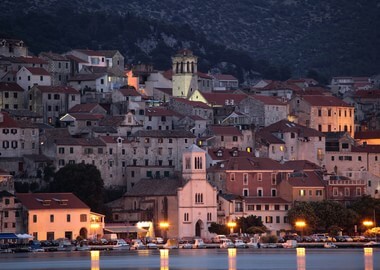 Although not technically a city, Hum, Croatia, is called the smallest city in the world because only 17 people live there. It's easy to be jealous of those lucky people living inside this fairy tale! 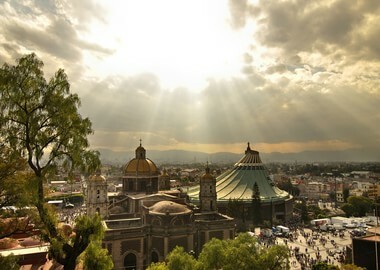 The Basilica of Our Lady of Guadalupe welcomes around 20 million visitors each year. It is the most visited Catholic site in the world, and the third most visited sacred site in the world. Have you ever wanted to hug a country? 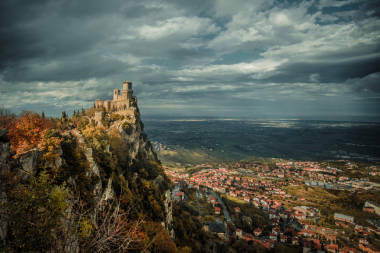 If you wanted to join hands with friends and make a circle around the Republic of San Marino, you would need over 26 000 friends. But no quest is too much for such a lovely country! A small autonomous country within the Kingdom of Denmark, this fairytale-like land has just under 75 thousand residents. All 75,000 of us simply had to take a look before we continue reaching for the Moon! Are you a Marathi speaker? Spoken in India, Israel, Mauritius. Marathi is mostly used in the Indian state of Maharashtra and the neighboring states. According to the existing data, there are almost 72 million of Marathi first-language speakers. The Pitcairn Islands is a group of four islands in the southern Pacific Ocean. Of the four, only Pitcairn is inhibited, and the group forms the Last British Overseas Territory in the Pacific. 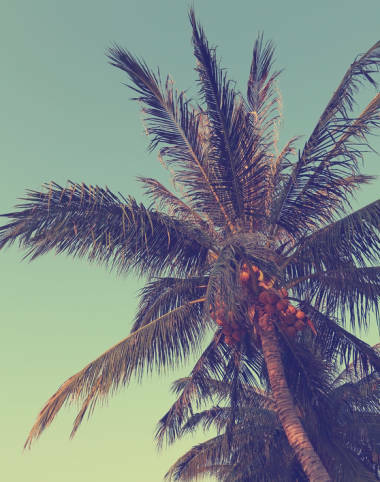 With year-round warm weather and only 56 neighbours, it sounds like paradise! Prepare to enjoy the company of many! They are third most populated cities in the world. The megacities in Mexico, India and Brazil are keeping up with the worldwide trend with around 21 million residents each. 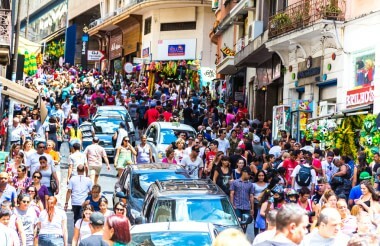 Currently, 54 percent of global population lives in urban areas. According to the UN's prognosis, by 2050 that number will probably jump to 66 percent. This architectural marvel hides many "mini-marvels." The Wishing Column inside Hagia Sofia was said to have healing powers. Behind this story lies a legend about Emperor Justinian resting his head upon the column after complaining about a headache and miraculously recovering. 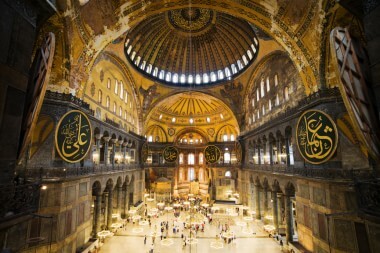 This and other historical and architectural jewels adorning the museum are the reason over 3 million people visit Hagia Sofia every year. Once the tallest building in the world. 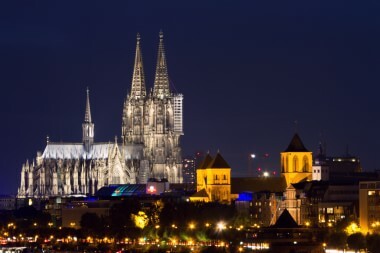 The impressive Gothic cathedral and UNESCO's World Heritage Site was completed in 1880, many centuries after the construction was started in 1248. It requires constant attention of over 80 dedicated stonemasons, roofers and other experts. Meanwhile, 6 million visitors keep pouring in every year. In any case, plan long in advance. You don't want abundance of options to cause confusion and lack of harmony within your little group of Barcelona visitors. 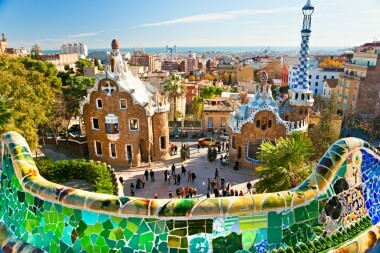 One more thing, you guys will be among over 7 million guests enjoying Barcelona each year. The idea of a roaming-free Europe was immediately "loved" by those traveling within the Union. We'll see what will become of this initiative. Meanwhile, the EU had 631.4 million cell phone subscribers in 2013, in comparison with 95.8 million in 1998. The translation of Lahnda is "west". Lahnda is spoken in the western part of the Pakistan's Punjab province. 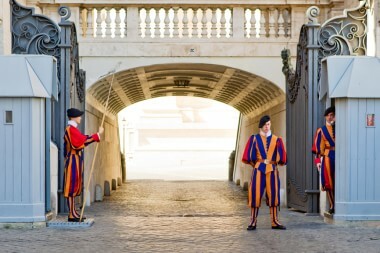 The name Swiss Guard refers to the (Swiss) soldiers who served on courts across Europe in the late 15th century. They were well-known mercenaries and guards for hundreds of years. What we refer to as a Swiss Guard today is usually the Pontifical Swiss Guard of the Holy See. These 110 people serve as kind of bodyguards to the Pope, and they get to wear fun uniforms! With great power, come great ... afterlife companions and bodyguards? There are many perks of being an emperor, no doubt about that. 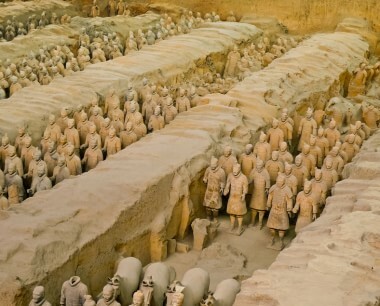 And even though we know fairly little of his life, the first emperor of China Qin Shi Huang was certainly quite well off after death: since the first discovery in 1974 an estimated 8,000 life-sized terracotta warriors, almost 700 horses, chariots, musicians, strongmen and such were unearthed in Shaanxi province. These were meant to keep the emperor company and keep him safe in the afterlife. And imagine, all this was undertaken in the late third century BCE! So many beautiful things to discover! The Republic of Armenia is often depicted as an exotic, genuine land of wild mountains and colorful wildflowers, monasteries and monuments, rich history and a bright future, of man living with nature breathing the free Caucasus air. And indeed, many tourists rush to visit Armenia. 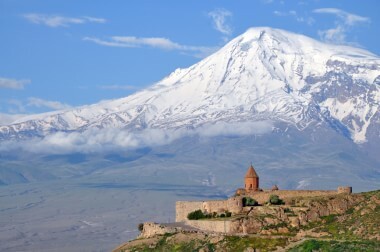 In 1995, just four years after the fall of the Soviet Union, Armenia had around 12,000 visitors, and the numbers have been rapidly growing ever since. Is promoting it a wise idea? 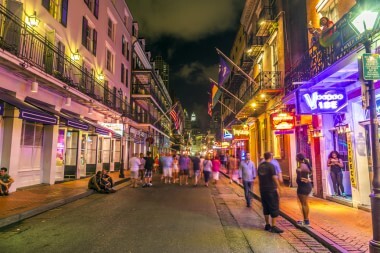 The number of tourists (about 37,000 a year) is projected to rise. 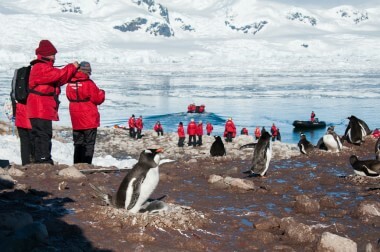 While this is a practical way to turn attention to the significance of Antarctica, it does awaken concerns about the harmful effects of tourism. Some guidelines have been established that have to be followed. One of the visitor rules says: "Do not walk onto glaciers or large snowfields unless properly trained." 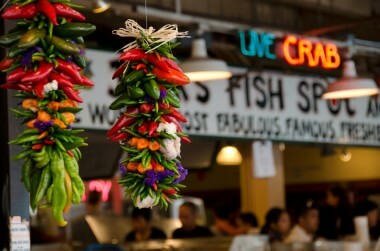 Seattle's historic open market has up to 40,000 visitors a day! And not just because of these colorful, spicy pyramids:) More than a century old, this always bustling market place offers just about anything - from vinyls and comics to fish and veggies. In fact, using the word "market" when giving directions would probably create a confusion, because it looks like a neighborhood in its own right. See the blue and see the new, but feel the nostalgic ambience, too. St. Thomas (52,900 residents) and the entire U.S. Virgin Islands are not only about the transparent blue water and white sand we are used to seeing in commercials and holiday brochures. Take the St. Thomas harbor Charlotte Amalie for instance. 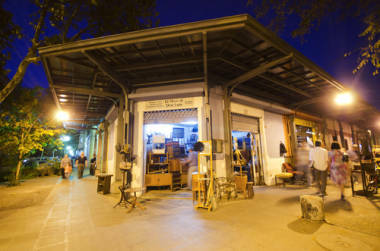 Although vibrant and modern, the Virgin Islands' capital still "owns" that old-town feel. See for yourself! Yes, it is a tiny country, but it will keep you busy at every altitude. Whatever your preliminary plans, do not leave before you see lakes Bled and Bohinj sparkling among the mountains. We hope all the 1.5 million visitors to Slovenia in 2005 went there (the number of guests per year reached over 2 million by 2012). Those who have been fortunate to enjoy the kindness of the Afghani hosts say that they go to great lengths to make their guests feel welcome. Abundance of food (and tasty tea the country is famous for) is just one part of it. Their unselfishness and readiness to open the door at any time and invite you into their home although you never really announced your visit is an irreplaceable value not so common these days. Hats off to these warm hearts among Afghanistan's population of 31.8 million. Most of the 166 million Bangladeshis live along the world's largest delta - Bengal Delta, where Ganges and Brahmaputra rivers flow into the Bay of Bengal. About 50 million of them are involved in the production of the highest quality jute they proudly call Golden Fiber. 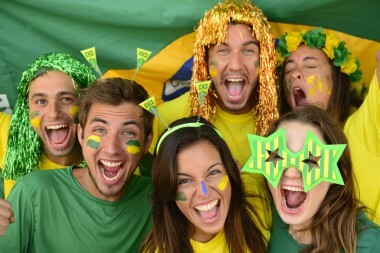 Out of Brazil's 202.7 million people, 62% are under 29 years of age, while the unrecorded percentage are passionate soccer fans and master footballers. As the saying goes: "The English invented it (the game of football), the Brazilians perfected it." 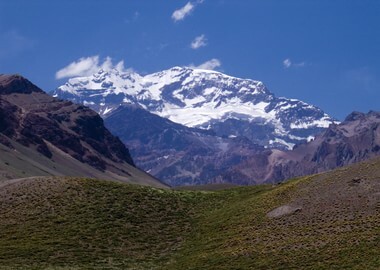 Ninety percent of Chile's 17.4 million people speak Castellano. And they speak it pretty fast:) Some of the words we stumbled upon that might come in handy: hueon (dude), bacan (cool), filo (fine). We should definitely visit with these guys and practice our Castellano; we might need it again on our way to space! Among 25.8 million of people in Ghana there are those who traditionally rely on fishing for both food and work. 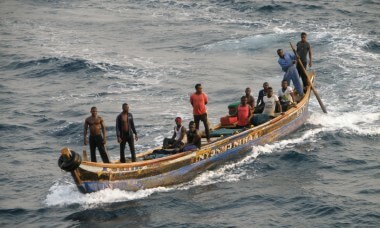 Ghana's fishermen are also known for their singing; the songs are to motivate them and set the working pace, including when putting out or pulling in the net. 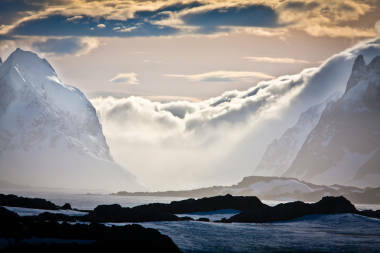 This intact Antarctic paradise is accessible only by sea, and there are no inhabitants - only about 30 people who work either as Government Officers or as staff in the British Antarctic Survey. But, there are many that care about this little piece of life as it once was, and they work through the South Georgia Association. 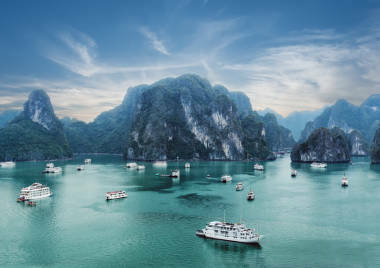 Its 253 million residents create a beautiful mix of hundreds of cultures and languages spreading over thousands of islands. Hence the name Indonesia: "Indos" is Greek for India and "nesos" stands for an island. 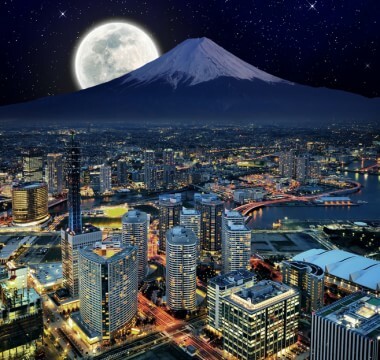 The country of 127.1 million residents, who have incorporated into their daily lives a mix of ages old festivals and modern rituals, Japan has a long-standing tradition of celebrating the Moon. 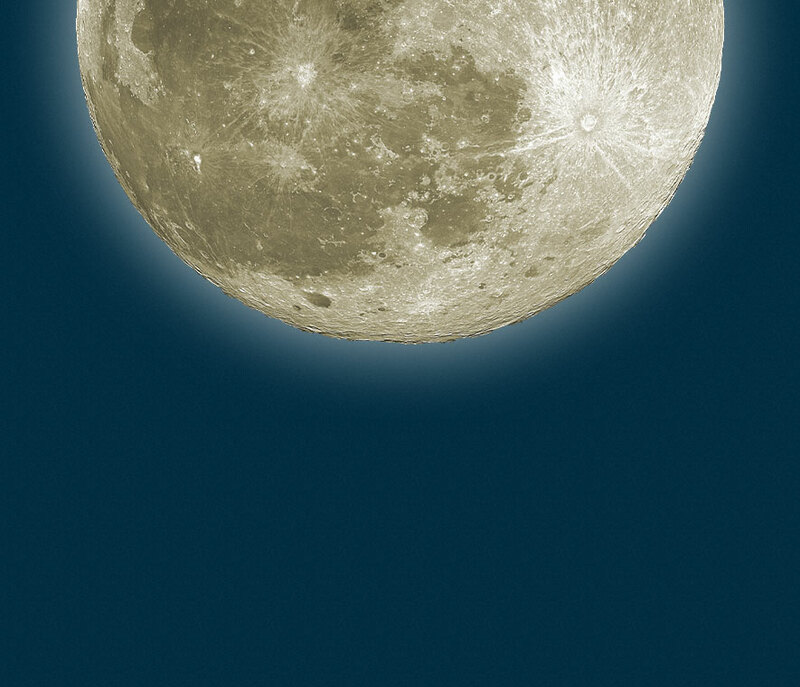 September is the time for Tsukimi or "moon-viewing." This is when Japanese people quietly bask in the Moon's beauty and put food offerings on the balconies and windows bathing in the moonlight. Most of the 15.5 million Cambodians practice a form of Buddhism called Theravada Buddhism, which emphasises personal liberation through one's own efforts. 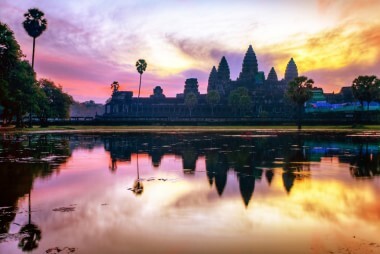 This in the photo is not a painting of an imaginary castle, but Angkor Wat, a Buddhist temple complex in Cambodia and one of the largest religious structures ever built. Over 24 million people living in North Korea are surely proud of the sites like Myohyangsan, "the mountain of mysterious fragrance." The name refers to sweet-smelling, rare types of flowers covering the mountain's slopes, famous also for the enigmatic sounds bouncing off them. 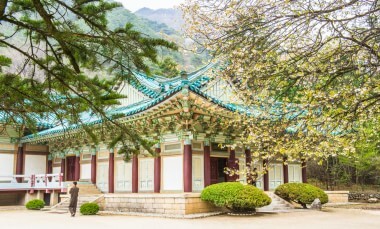 Imagine spending a summer day in such a place and in a pavilion like this one. When Christopher Columbus spotted two of the three Cayman Islands (current population 55,000) in 1503 he called them Las Tortugas for the "navy" of turtles his expedition encountered in the blue waters of the Caribbean. The settlers on the Cayman Islands relied on turtles for their income and for food during the 1700s. 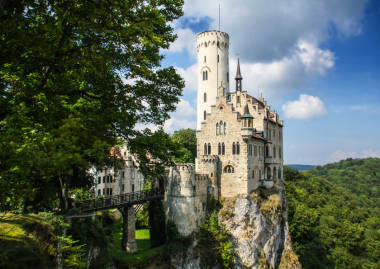 The Principality of Liechtenstein lies locked in the heart of Central Europe, and is a good spot for us to slow down on our way to the Moon and look how far we've come. Over 35,000 people live on a territory of 160 square kilometers, and they are quite prosperous - there are more registered companies than there are citizens! Grimaldi family has been ruling over Monaco, the principality of 30,508 people, for seven centuries. Do you know that one of its princes, Albert I, is considered the father of oceanography? He organized four Arctic expeditions in the early 20th century. On the 100th anniversary of one of his great-great-grandfather's explorations, prince Albert II of Monaco (in the photo, with princess Charlene) retraced his journey in 2006. When the little snowdrop tried to push through the snow with all its fragile strength, the Spring intervened clearing out the snow and thorns around it. This angered the Winter and she sent wild snowstorms their way. While protecting the little flower with its hands, Spring hurt her finger and a drop of blood fell on the snow. The related red and white trinket all 3.6 million Moldovans recognize as the symbol of spring is called Martisor (little March). Among 107.7 million people living in the Philippines there are some who have long perfected a special craft - pearl hunting. Bajau Laut have been diving off the Sulu Archipelago since even before 1300s, bringing to the surface food, large pearls and gleaming mother-of-pearl shells. They can freedive to depths of over 20 meters. A country of 44.3 million people, Ukraine is a treasure trove of ancient songs and dances. But, that's just one piece of its rich culture and history. 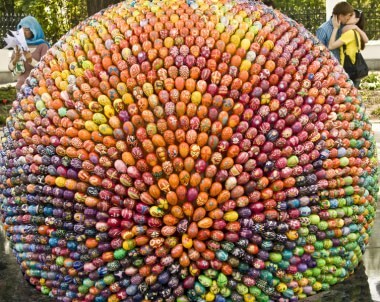 For instance, do you know that the Easter egg (pysanka) tradition in Ukraine is thousands of years old? What was it that led to those Ugandan true-to-life, analytical proverbs touching on all aspects of life? Here are some of the traditional wisdoms many of almost 36 million people of Uganda are very familiar with: One who has not been around the block thinks that the one's mother is the best cook; Heavy thunder is not always a sign of heavy rain; Readiness is not a sign of weakness; One afraid of heat cannot become a chief. Climbing to touch the Moon is hard work, and we need to rest every once in a while. Why not do that in a Pacific paradise? Only 15,500 people inhabit Wallis and Futuna, and they speak three different languages! 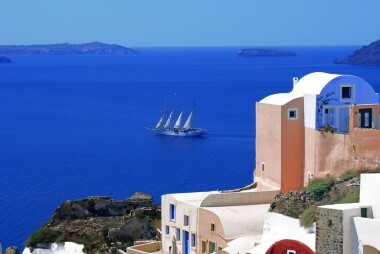 Who wouldn't want to explore the cultural and biological diversity of these volcanic islands? 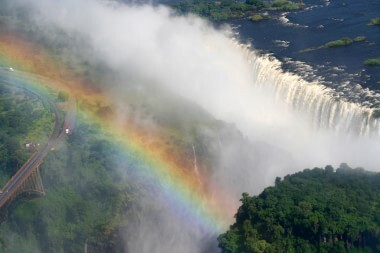 Zimbabwe is a country of 13.8 million people known for their love of dance, and a land of Victoria Falls known for their waltzing water mist. 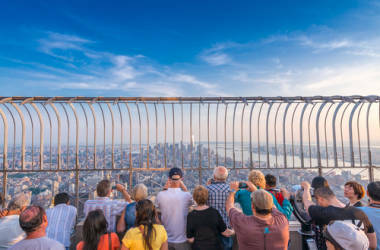 If you go to New York City, you will definitely stumble upon the Rockefeller Center and find yourself roaming among 300,000 people who visit it daily. 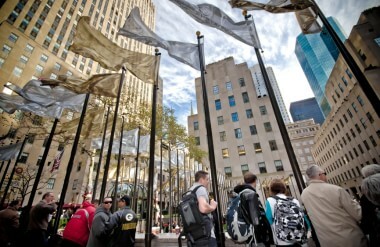 If we take the math even further, this means that on average 27 million people visit the Rockefeller Center in the course of three months. Where to first in Morocco? 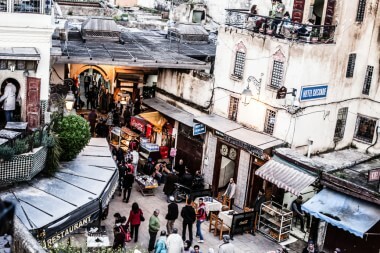 Many among the 10 million annual visitors to Morocco have certainly been to Fez, the country's cultural center and its former capital city (in the photo). On an entirely different note, have you ever seen or heard of the red, flat-top hat of the same name? Why all the talk about Russia? Because Russians are filling their cities with new ideas and concepts. 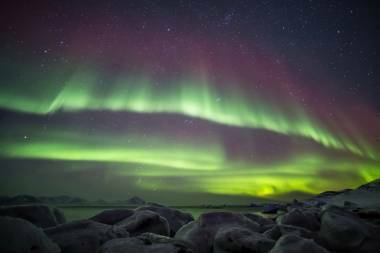 Over 28 million visitors in 2014 had the opportunity to witness this. Arts and entertainment are an unavoidable part of the trend, and so is the project to give the world a Russian version of the Silicon Valley, just outside of Moscow. So, the creativity is there, but let us say that the view is not that bad either:) Quite the contrary. 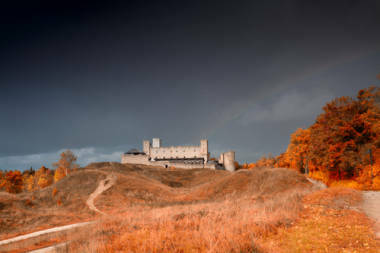 The multi-purpose arena in Estonia, called Rakvere Spordihall, was built in 2004 in the beautiful little town of Rakvere, which also "hides" a spectacular medieval castle (in the photo). We are now at the 2,900 mark, equal to the record number of spectators at the Spordhill recorded at the basketball finals during the season 2009/10. The whole, glittery world packed in 6.7 kilometers. 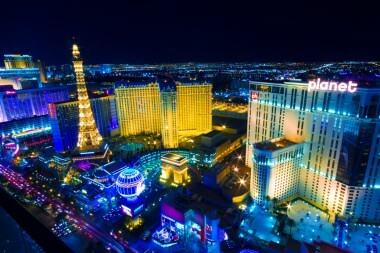 Gondoliers, the Eiffel Tower, dancing fountains, casinos, hotels, eateries, parks and gardens. You name it. This too-fantastic-to-be-true view hails from the Secret Beach. A piece of paradise like that should remain a secret, for sure. 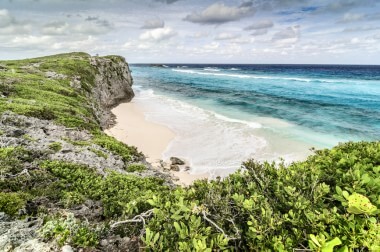 The beach is situated in the Middle Caicos, the largest and least populated (275 residents) island in this territory of 49,070 people in the West Indies. 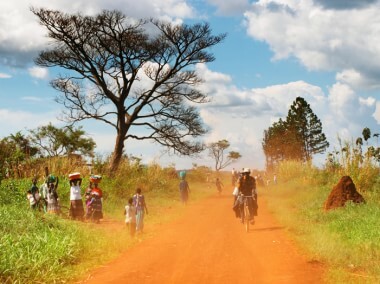 Chad's 11.4 million people live in three climate zones and in some areas are exposed to quite extreme temperatures. Not surprising, as one half of the country is covered by Saharan Desert, including its out-of-this-world oases. Dry Tortugas National Park in Florida had 64,000 tourists in 2014. 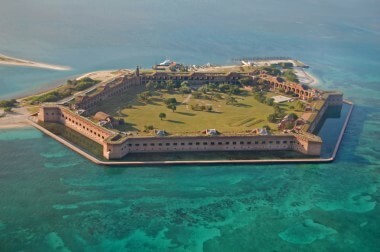 A home of Fort Jefferson and diverse marine ecosystem, the park is closer to Cuba than to the U.S. mainland. 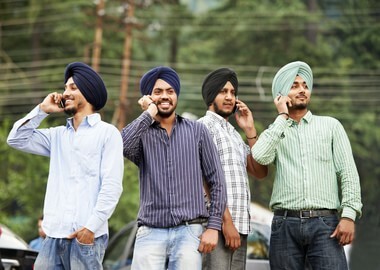 Its 177 million people come from over 250 ethnic groups and speak more than 500 languages. Wow, we are stopping here just for a minute to ask them how is that even possible?! 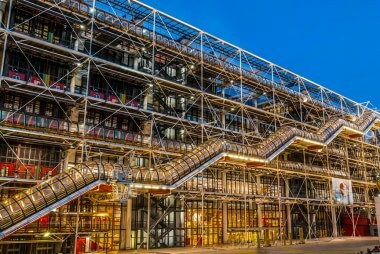 The Centre Georges Pompidou, built in 1977 in Paris, was a brave stroke of architectural genius by Renzo Piano and Richard Rogers. The art and culture housed behind this amazing facade have been seen by 150 million people since the center's opening. Although it's pretty hard to believe. Only two residents per square kilometer. Needless to say, Australia, with its 22.5 million people and only about 10% of inhabited land, is the country with the lowest population density in the world. 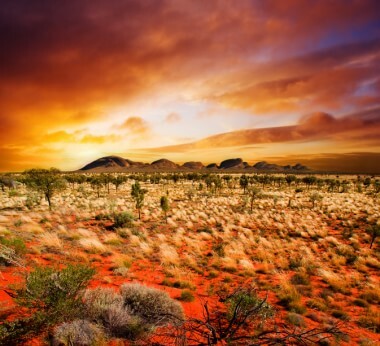 And how beautiful is this vast landscape in central Australia? Matala, Crete, was THE hippie place in the 60's and 70's. In 2012, a year after an event was held in celebration of the area's hippie history, the fledgling Matala Beach Festival welcomed 58,000 visitors. An island of 1190 residents, lying pretty in the South Pacific Ocean, is where we take in this spectacular view before we continue to climb towards space. A tiny island in the South Pacific Ocean is home to some perfectly-shaped pine trees and to just over 2,000 people. It was discovered by captain (James) Cook in 1774. We are far away from space and from our final goal, but why not enjoy this place for a moment? 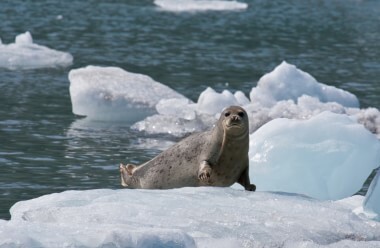 We are now visiting the archipelago situated between the Arctic Ocean, Barents Sea, and Greenland Sea. It was discovered by the Dutch captain Willem Barentsz in 1596. 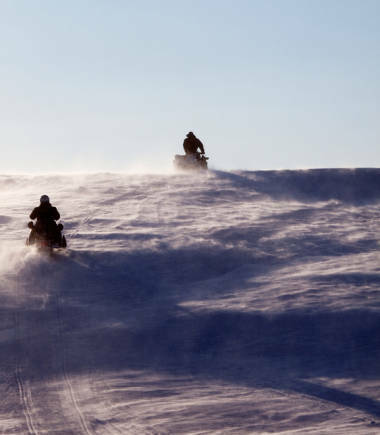 Want to tour parts of Svalbard on snowmobile (and greet some of its 1,872 residents along the way)? 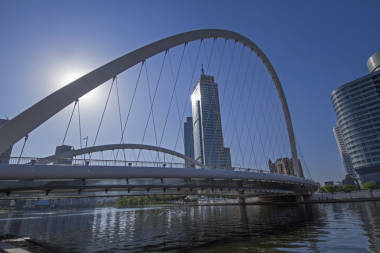 Tianjin eco-city in China currently has 6,000 residents, who are living in a place that is supposed to become an ideal of modern urban life. Tianjin, may your dreams come true! Lampedusa, a tiny Italian island of around 6,500 residents - and our current rest stop - sits between Africa and Europe, absorbing influences from both. 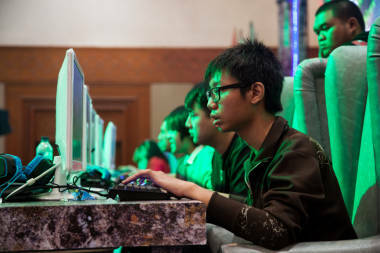 We are now 22,000 travelers strong, same as the number of enthusiasts from 70+ countries who participated in the Global Game Jam 2014 in order to create 4,250 games. Lasqueti islanders, all 400 of them, definitely enjoy a special lifestyle. 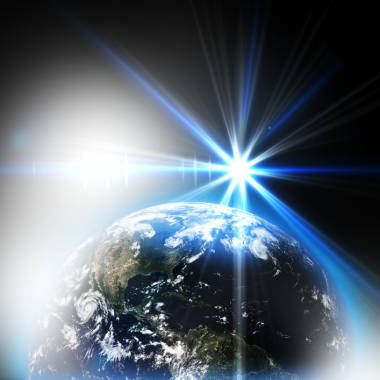 They choose to live in agreement with nature, using renewable energy sources or having no electricity at all. Lasqueti is our rest point off the coast of the Vancouver Island (in the photo). 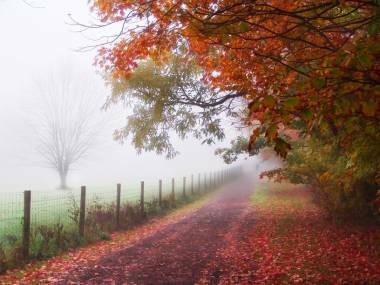 ...in Pennsylvania (5,600 residents) is a birthplace of the U.S. founding father Thomas McKean. Operation Highjump (1947), which included 4,700 members of the U.S. naval forces, was the largest ever expedition to Antarctica. Here we join galleries from all over the world who participate in the prestigious art show with over 4,000 works. 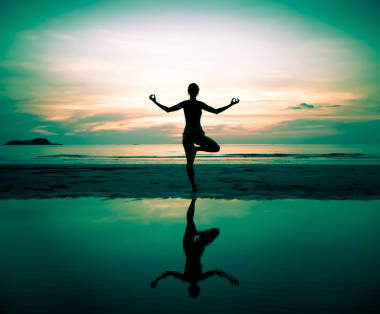 The first International Yoga Day, another event on our way to the Moon, was celebrated by 3,500 people in Houston in 2015. This town in the U.S. state of Michigan is home to 190 people and, as far as we were able to establish, that is about the same number of sunny days a year over there! 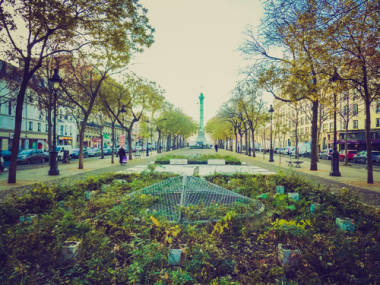 About five hundred artists participated at the Grand Contemporary Art Market in Paris in recent years, at the Place de la Bastille. Not even public places in Paris are devoid of art. That's why we stopped here to feast our eyes on all that beauty! 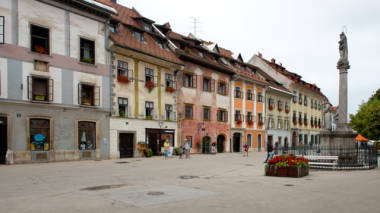 A grand open air theatre performance Passion Play, based on the oldest written Slovenian dramatic text, is usually performed by 640 local amateur actors or more, in the town of Skofja Loka (in the photo).